Heat half the olive oil in a large skillet over medium heat. Sauté the shallots and garlic for a couple minutes, then add the squash and leek. Sauté, stirring until soft, then add the stock and wine. Season with salt and pepper. Bring to a boil, lower the heat, cover and simmer for 5 minutes. Let cool. In another skillet, heat the rest of the oil, and sauté the zucchini and fennel until soft. Sprinkle with salt, pepper, and oregano, and mix well. Purée the leek, squash and stock mixture in a blender, until creamy. If it needs more liquid, add more stock 1 tablespoon at a time. Put the quinoa, leek and squash cream, and sautéed vegetables back in one of the skillets, and turn the heat up to medium, stirring until everything is very hot. Serve sprinkled with pine nuts and parsley. For a non-vegan version, you can use regular cream instead of the leek and squash cream, and sprinkle the risotto with grated parmesan cheese. You can make this recipe with any rice instead of quinoa, or with your favorite short pasta. Use Arborio rice instead for an authentic risotto. To prepare the quinoa, put it in a pan with twice the amount of water, and once it boils cook it for 20 minutes at medium heat. Drain any excess water. 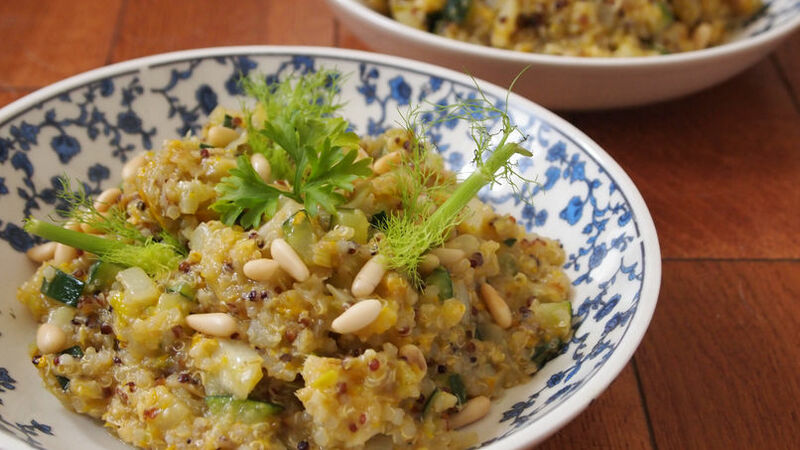 Quinotto (quinoa risotto) is an increasingly popular dish in the international -and especially in the vegetarian/vegan- food scene. This new take on the Italian risotto replaces the delicious yet heavier Arborio rice, with the gluten-free, protein-rich seed that is rocking the health foods world: quinoa. The recipe I’m sharing today is not only gluten-free, but also vegan, as I used summer squash and leeks to replace the cream some like adding to this dish. I also sprinkled it with pine nuts instead of using parmesan cheese. The result is delicious and appealing to everyone; not the typical granola experience you would expect. I encourage you to try it, and see for yourselves.